ZHU GUANG, a 25-year-old product tester, projects casual cool in his red Adidas jacket and canvas shoes. He sports the shadowy wisps of a moustache and goatee, as if he has the ambition to grow a beard but not the ability. On paper he is one of the millions of up-and-coming winners of the Chinese economy: a university graduate, the only child of factory workers in Shanghai, working for Lenovo, one of China’s leading computer-makers. Calling yourself a diaosi has also become a proud statement of solidarity with the masses against the perceived corruption of the wealthy. The word itself entered the language only recently, appealing to office grunts across the country, especially in the IT industry. A mostly male species, diaosi are often daydreamers with poor social skills and an obsession with online gaming. They are slightly different from Japan’s marriage-shunning “herbivore” young men in that fewer of them have chosen their station in life. Society has chosen it for them, especially with property prices climbing well beyond their reach. Several recent studies show that, while incomes across Chinese society continue to rise, social mobility has worsened. Yi Chen of Nanjing Audit University and Frank A. Cowell of the London School of Economics found that, since 2000, people at the bottom of society were more likely than in the 1990s to stay where they were. “China has become more rigid,” they conclude. An online video sketch show, “Diaosi Man”, shown on Sohu.com, an internet portal, mercilessly mocks the tribe. Since its debut in 2012, the show’s episodes have been streamed more than 1.5 billion times. In one recent episode a man tries to impress his beautiful dinner date with how busy he is at his job. He then receives a phone call from work, apologetically takes his leave to go to the office and finally pops up again as a waiter when his date asks for the bill. In the same episode a frustrated new driver curses repeatedly at a Lamborghini in the next lane and screams, “Are you bullying me because I don’t know any traffic cops?” In the next scene he is in a neck brace and his nose is broken. Mr Zhu says what makes him a diaosi is that he is the son of factory workers. He is not fu er dai—second-generation rich—or guan er dai—the son of powerful government officials (it does not escape a diaosi’s notice that those two categories often overlap). He and his diaosi colleagues feel that, with connections or cash, they might have attended a better university and found a better job. With after-tax income of nearly $8,000 a year, Mr Zhu would look to many people in China comfortably on his way to the middle class. He is among the lower wage-earners at Zhangjiang Hi-Tech Park in Shanghai, but even many higher earners call themselves diaosi, or refer to themselves as “IT labourers”. 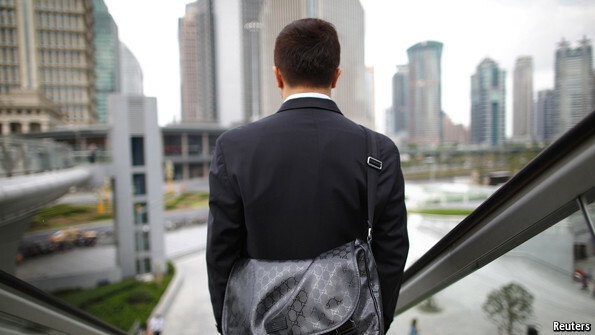 Though their salaries are above average even in Shanghai—which had China’s third-highest annual urban disposable income per person in 2012 at 40,000 yuan—the cost of appearing successful is stratospheric. A fancy flat and a cool car are well beyond their reach. They are wage slaves who cannot hope to be gao fu shuai—tall, rich and handsome—and marry a woman who is bai fu mei—fair-skinned, rich and beautiful. This might seem quite normal for a rapidly developing economy. But Zhang Yi, a sociologist at the Chinese Academy of Social Sciences, a government think-tank in Beijing, says this diaosi feeling of relative deprivation is a troubling consequence of China’s growing wealth gap. In an interview devoted to the subject for the website of Phoenix Television, a Hong Kong satellite network, Mr Zhang concluded that people at the bottom feel utterly alienated. They feel less hopeful than they did before of ever moving up in life, he said. In spite of this, however, they do still represent a marketing opportunity. There are, after all, many more of them than there are millionaires, even though it can be difficult to define the target market. At Dianping, a website offering restaurant reviews and consumer deals, Schubert You targets very low-wage workers in smaller cities (earning about $150 to $450 a month) with coupons and group discounts. Mr You does not consider the IT workers of Shanghai and Beijing to be true diaosi. But surveys show they believe they are. Last year Analysys International, a research company in Beijing, asked a broad cross-section of office workers if they saw themselves as diaosi. More than 90% of programmers and journalists and about 80% of food and service industry and marketing workers said they did. Those surveyed who least identified with being losers were civil servants, working for the government or the Communist Party. La ciudad neo-liberal tiende a desarrollar con gran ímpetu comunidades aisladas que reflejan las diferencias entre las clases sociales, segregándolas entre si y limitando enormemente los espacios y paisajes. Dicha tendencia responde al principio de acumulación del capital aplicado al desarrollo urbano. Es decir, a la acumulación de capital en las ciudades con el fin de producir dinero. Dicha acumulación tiene lugar mediante la inversión en espacios urbanos, la construcción de condominios y de estructuras de gran escala con un especial interés en los estratos socioeconómicos altos. En este contexto la inversión en viviendas asequibles se reduce y/o se limita a las zonas más alejadas de los centros urbanos, incidiendo más aún en la dinámica segregadora. En definitiva, la concentración de capital es una barrera para el desarrollo urbano y se opone a lo que debería ser una ciudad. …hace poco estuve en Guayaquil, Ecuador. Ahí hay un área de la ciudad donde, a los costados de un gran camino principal, solo existen comunidades privadas. No puedes salir del camino principal para entrar a esas comunidades sin un permiso residencial. Entonces te preguntas qué tipo de mundo se construye allí, en que la experiencia urbana de las personas queda secuestrada tras estos muros, tienen un contacto casi nulo con personas de otras clases sociales. Me gustaría además prestar especial atención a la siguiente foto, pues en ella se puede apreciar más de 60 años de evolución urbanística en Polonia. En el plano corto, una casa típica del rural polaco donde, de hecho, todavía reside una persona de edad avanzada y dedicado a labores agrícolas. En un segundo plano, una construcción de los años 90, pero que mantiene de alguna forma el estilo de los típicos bloques soviéticos. Por último, un edificio de muy reciente creación donde, como se puede observar, se levanta una verja que lo separa del resto del barrio. Easy, simple and very clear, this explanation of social inequality from this article “Growing inequalities in science“. One of the most common misconceptions regarding inequality consists of thinking that an unequal distribution of resources is the result of an unequal effort to achieve them. Although this might be the case in certain situations, when it comes to particular individuals, the fact is that there are systemic structural forces governing the result of our efforts. The possibility of our personal, social or professional success still pretty much depends on our ascribed status, that is, an involuntary assigned position within the society. Sociologists use the expression social stratification to describe the way in which these structural forces organize groups and individuals in a phenomenon common to all societies. 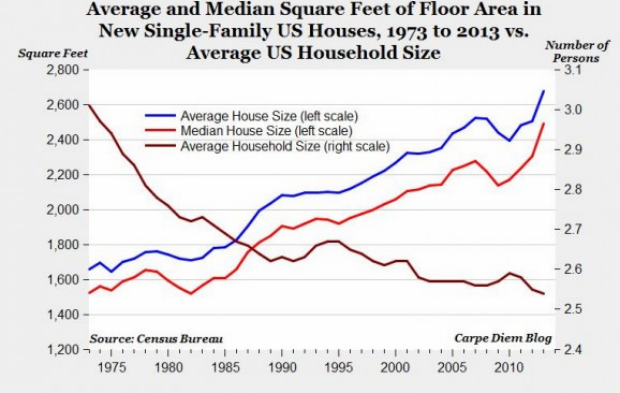 America’s bloated house size is a two-sided problem. For one, it’s yet another indicator of the nation’s deepening economic divide. The wealthy are pouring more and more money into trophy homes, while the professional and knowledge classes, too, are demanding more space for family and media rooms. The poor, meanwhile, are crammed into urban quarters or pushed out to older, dilapidated housing in the suburbs.